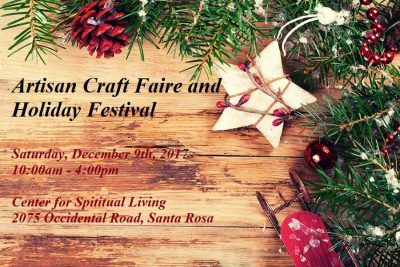 If you are a Sonoma County artisan with items to sell in a craft faire setting, we are interested in reviewing your application. We will be looking for quality, a good mix of products, variety, and appropriateness for our market. All items must be hand-made by the seller and local to this county. No manufactured items, such as printed books, will be accepted. We will be accepting vendor applications for this event up until September 27, 2017. Applications can be found at our website: ArtisanCraftFaireCSLSR.weebly.com on the Vendor Info page or a paper copy can be picked up at the Center during business hours. The jurying process will take place in early October. Deadline is September 27, 2017.